Every year, during the rainy season, the mountain gorillas of Central Africa migrate to the foothills and lower slopes of the Virunga Mountains to graze on bamboo. For the 650 0r so that remain in the wild, it’s a vital food source. 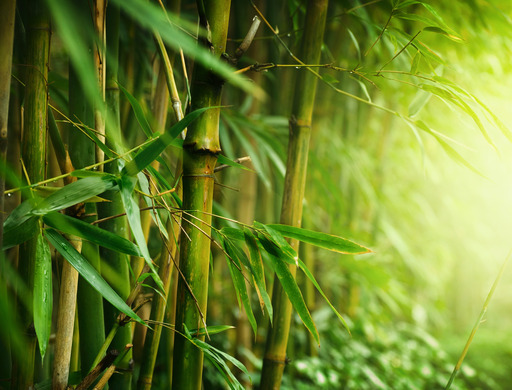 Although there are at almost 150 types of plant, as well as various insects and other invertebrates, bamboo accounts for up t0 90 percent of their diet at this time of year. Without it, says Ian Redmond, chairman of the Ape Alliance, their chances of survival would be reduced significantly. Gorillas aren’t the only locals keen on bamboo. For the people who live close to the Virungas, it’s a valuable and versatile raw material used for building houses and making household items such as mats and baskets. But in the past 100 years or so, resources have come under increasing pressure as populations have exploded and large areas of bamboo forest have been cleared to make way for farms and commercial plantations. Sadly, this isn’t an isolated story. All over the world, the ranges of many bamboo species appear to be shrinking, endangering the people and animals that depend upon them. But despite bamboo’s importance, we know surprisingly little about it. A recent report published by the UN Environment Programme (UNEP) and the Inter-national Network for Bamboo and Rattan (INBAR) has revealed just how profound is our ignorance of global bamboo resources, particularly in relation to conservation. There are almost l,600 recognized species of bamboo, but the report concentrated on the l,200 or so woody varieties distinguished by the strong stems, or culms, that most people associate with this versatile plant. Of these, only 38 ‘priority species’ identified for their commercial value have been the subject of any real scientific research, and this has focused mostly on matters relating to their viability as a commodity. This problem isn’t confined to bamboo. Compared to the work carried out on animals, the science of assessing the conservation status of plants is still in its infancy. “People have only started looking hard at this during the past 10-15 years, and only now are they getting a handle on how to go about it systematically,” says Dr. Valerie Kapos, one of the report’s authors and a senior adviser in forest ecology and conservation to the UNEP. Bamboo is a type of grass. It comes in a wide variety of forms, ranging in heightfrom 30 centimeters to more than 40 meters. It is also the world’s fastest-growing woody plant; some species can grow more than a meterin a day. Bamboo’s ecological rote extends beyond providing food and habitat for animals. Bamboo tends to grow in stands made up of groups of individual plants that grow from root systems known as rhizomes. Its extensive rhizome systems, which tie in the top layers of the soil, are crucial in preventing soil erosion. And there is growing evidence that bamboo plays an important part in determining forest structure and dynamics. “Bamboo’s pattern of mass flowering and mass death leaves behind large areas of dry biomass that attract wildfire,” says Kapos. “When these burn, they create patches of open ground within the forest far bigger than would be left by a fallen tree.”Patchiness helps to preserve diversity because certain plant species do better during the early stages of regeneration when there are gaps in the canopy. Reading Passage has six sections A-F. Which section contains the following information ? Write the appropriate letters A-D in boxes 8-11 on your answer sheet. 8 ABCD Destroying bamboo jeopardizes to wildlife. 9 ABCD People have very confined knowledge of bamboo. 10 ABCD Some people do not think that bamboo is endangered. 11 ABCD Bamboo has loads of commercial potentials. Answer the questions below using NO MORE THAN TWO WORDS from the passage for each answer.